Whitework Quilting is more than a quilt book; it is an expression of love for the beauty of art in cloth. Whitework Quilting is an expression of love for the beauty of art in cloth. Whitework Quilting ~ Creative Techniques for Designing Wholecloth and Adding Trapunto to your Quilts by Karen McTavish combines the best of how-to, history and art. This book is a fusion of two concepts: an artful, coffee-table lexicon of award-winning quilts, and a resourceful, knowledge guide structured to lead readers to their own wholecloth quilting success. This book features some of the country's best quilters, showcasing 60 award-winning Wholecloth, Trapunto, Appliqué and Pieced quilts. Never before has so complete a collection of	wholecloth quilts been amassed. Images of the quilts fill the pages and include incredible, detailed shots. Viewing the quilt in person with a magnifying glass would not render better views of the stitching. Karen's humor and quilting knowledge make the book a joy to read. In very little time you will understand the core concepts of creating your own heirloom wholecloth quilt. Whitework Quilting breaks the "Quilt book" mold. It is a book of art and practicality. It is comfortable on your coffee table or your work table. This is more than a quilt book; it is	an expression of love for the beauty of art in cloth. This hardcover, square-backed book with a satin marker ribbon, features over 60 quilts, is 192 pages, full color and retails for $39.95. To learn more about the location photography sites for Whitework Quilting please click on the links listed below. 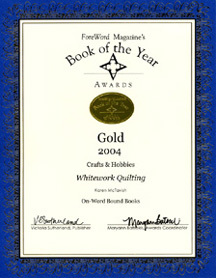 On-Word Bound Books is pleased to announce that Whitework Quilting by Karen McTavish won the ForeWord Magazine Book of the Year Award in its category (2004). ForeWord Magazine is the only review trade journal devoted exclusively to covering books from independent publishers. Library Journal: Award-winning quilter McTavish has a passion for wholecloth quilts, which are traditionally made from a single piece of fabric usually white adorned with elaborate quilting patterns and sometimes combined with trapunto, a type of padding that adds dimension. She presents a gallery of 60 wholecloth quilts photographed so that readers can see the whole quilt and details of the quilting and trapunto work; commentaries by the artist and the author accompany each. Instructional chapters cover supplies, using architectural details as inspiration for wholecloth quilting designs, adding trapunto to wholecloth quilts, working with pieced or appliquéd quilts, and adding shadow and color trapunto to wholecloth quilts. This beautiful coffee-table book is highly recommended for large public libraries. Whitework Quilting ISBN: 0974470600 Copyright 2004 Reed Business Information. Midwest Book Review: Featuring full-color, full-page close-up photographs of artfully done whitework quilts, Whitework Quilting: Creative Techniques For Designing Wholecloth And Adding Trapunto To Your Quilts is a solid guide for machine and hand quilters alike. Extensive step-by-step instructions walk the reader through whitework quilting techniques to create artful, professional-looking creations. Chapters address wholecloth methods, trapunto, applique and pieced quilts, auditioning stencils and marking one's designs, and much more. A lavish and beautiful resource for those who are serious about creating memorable, original quilts for personal or professional purposes, and so wonderfully illustrated it is a joy to simply page through. 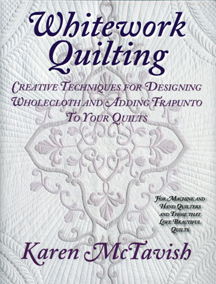 Hi Karen, I have recently purchased 4 of your books that have inspired me no end, then I also bought "Whitework Quilting". Wow what a beautiful book, I can not stop looking through it, each quilt reminds me of a beautiful wedding cake.I don't think I've ever done so much reading.You have opened another challenging door for me. Thank you so much for sharing. Patricia from Australia. All I can say is WOW!!!! I received my copy of Karen's book today and it is absolutely fabulous. I knew she would make sure it was done beautifully..... but this FAR exceeds any expectations I ever imagined. The details throughout are amazing- love the extra attention to the page borders made to match each quilt, the built-in ribbon bookmark, etc... Her words describing each quilt were so eloquent (thank you!) The quilts are extraordinary!!! It all is just perfect perfect perfect!!! Anyone who LOVES quilts and quilting will be blown away. Good morning Karen: I have received my copy of Whitework Quilting from On-Word Bound Books. You have done an absolutely outstanding job of this book. I am thrilled with the level of quality both in the selection of material and photography. I was a bit hesitant about pre-ordering as so much of whitework is about texture and would be difficult to photograph, but it is great. The closeups are going to be extremely helpful as I practice background fillers and the other techniques in the book. Last year in Kitchener, Waterloo during one of your workshops you had mentioned you had a new book coming out, (I purchased your first book and stencils), and I had made a point of watching for and am very happy I did. By the way, your workshops were thoroughly inspiring. Every once in a while with quilting we come across something that makes us want to learn how to do no matter how much work and practicing is involved so that we too can produce such beautiful things. Good Afternoon! I received my Whitework Quilting book yesterday and had a chance to really look at it last night, I bought the autographed book just in case I don't get to MQS this year. This book brings tears to my eyes because of the wonderful legacy you will be leaving behind some day. All the hours of love that went into these wonderful quilts leaves me in such awe that I admire each and every one of you. I took a class from Karen last year at MQS but was still intimidated and never finished my project. I feel now I can do it because of the legacy I want to leave to my grandchildren some day. Thanks to all of you and to Karen for inspiring us all! I have recently purchased 4 of your books that have inspired me no end, then I also bought "Whitework Quilting". Wow, what a beautiful book. I can not stop looking through it. Each quilt reminds me of a beautiful wedding cake. I don't think I've ever done so much reading. You have opened another challenging door for me. Thank you so much for sharing ~ Patricia from Australia.